Charmes-Chambertin (including Mazoyères-Chambertin). If Chambertin and Clos-de-Bèze are the undisputed kings of Gevrey-Chambertin, just so is Charmes-Chambertin the undisputed crown prince. At 30.83 hectares, Charmes-Chambertin, a Grand Cru climat in Gevrey-Chambertin, is more than twice the size of any other Grand Cru in the commune. 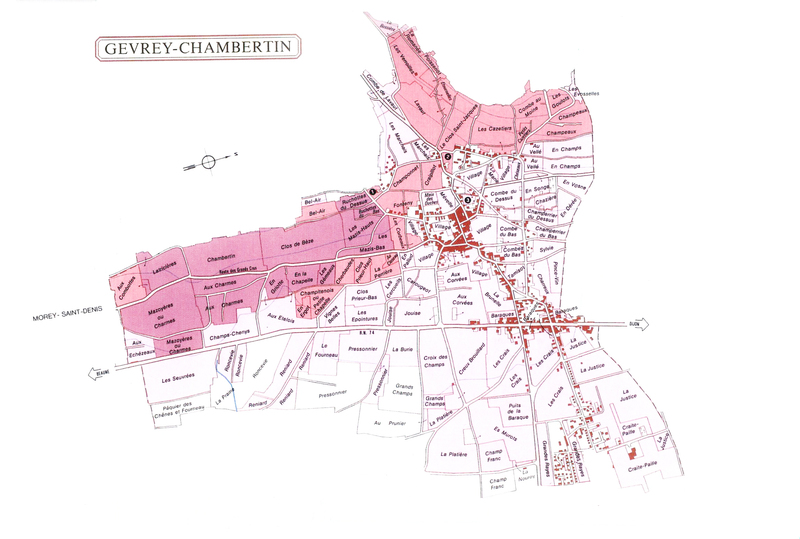 Charmes-Chambertin is comprised of two lieux-dits, Aux Charmes at 12.25 hectares, and Mazoyères at 18.58 hectares. Both climats may be bottled as Charmes-Chambertin, and usually are. Wine from Mazoyères, however, may also be bottled as Mazoyères-Chambertin, or as Charmes-Chambertin, Les Mazoyères. The Charmes-Chambertin vineyard lies south of the Beaune-Dijon Road (RN 74), with the Mazoyères parcel between Latricieres-Chambertin and the RN74; and the Aux Charmes lieu-dit just to the south of Chambertin. The vineyard faces east from an altutude of 260 meters. The base is Bajocian limestone, and the shallow overlying soil consists of decomposed limestone (called lave), clay and gravel. Of all the Grands Crus of Gevrey-Chambertin, Charmes is the most forward in its development, and provides the easiest drinking, early on. It is also among the most feminine. One is very tempted to call the wine “charming”, which would be an accurate descriptor, but the vineyard name actually derives from the word “Chaume” and refers to the fact that it was at one time a fallow field.